BG Season 4 CD Track List and Cover Art! 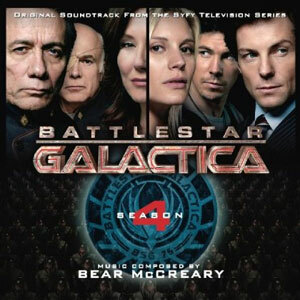 I wrote my first cue for Battlestar Galactica: Season 4 in August, 2007 and finished scoring the series finale in February, 2009. Earlier this year, I posted a blog entry asking all you fans what you wanted on the album. And, wow, you guys certainly responded! I kept that blog post handy while I was making my selections for the album. In fact, several of the tracks that made the final cut were ones I wouldn’t have considered were it not for an astute fan mentioning it here on this blog. The best place to pick up copy is at one of our live “Music of Battlestar Galactica” concerts at the House of Blues in San Diego, July 23, 24 and 25. Tickets are on sale now! Once the record comes out, I’ll write an entry going into detail about the individual tracks. But I knew you guys would want to see the track list early. A big thanks goes out to all the fans who chimed in on the blog here and helped me pick these cues. Also, I’m on TWITTER now! Follow @bsglive for concert updates and the most current information on special guests, surprise announcements, etc. See you in San Diego next month! UPDATE 6-20-09: I forgot to mention that I’m being interviewed tomorrow night (Sunday, June 21) on NPR’s “ALL THINGS CONSIDERED,” discussing my score for “Battlestar Galactica.” The show airs between 5:30 and 6:00pm, although that can change depending on time zone. Check local listings. Also, it will be on the NPR website starting at 7pm ET.